Call it the real whopper. If you want to taste one of the most gourmet burgers in The World the Fleur Burger 5000 is the meal for you. Chef Hubert Keller (as seen on “Secrets of a Chef” and “Top Chef Masters”) takes the traditional favorite to a new level with some of the world’s most expensive ingredients. 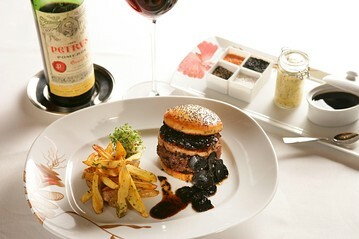 He starts with a Kobe beef patty, then moves onto seared foie gras and truffles on a brioche truffle bun. Still doesn’t sound like it’s worth £5,000? Just wait. The restaurant will deliver a bottle of 1995 Chateau Petrus wine (worth about £2,500) and two crystal stemware glasses to the home of anyone who orders the burger. There is no need to order in advance. What makes it so pricey? Lots of expensive ingredients. Start with a Kobe beef “patty” (more like a mountain of ground primo cow flesh), then top it with foie gras and black truffles. Oh, and don’t forget the “special sauce,” which is made with – no surprise – more truffles. Do fries come with it? Yes – at least judging from the photo the restaurant supplied us. But no word on the provenance of these spuds. C’mon, is that worth $5,000? OK, it’s not just about the burger. It’s also about what you pair with it, beverage-wise. At Fleur, the five-grand burger comes with a bottle of Petrus (the 1995 vintage, to be exact, dubbed by Wine Spectator magazine as “a genie in the bottle”). And don’t forget the stemware, either: Diners get a pair of Ichendorf Brunello glasses, imported from Italy (and the glasses are shipped to their home, post-feast). Once again, is that really worth five grand? Probably not. The Petrus goes for about $2,500 a bottle and Ichendorf glasses can generally be found for about $75 a pair. As for the actual grub, figure a max of about $50 for the Kobe beef (Sam’s Club sells it for even less, $25 for the foie gras and $300 for the winter truffles. (And these are very generous maximums.) That puts our burger at about $3,000 in real “value” – so unless the catsup is made with liquid gold, diners are essentially paying for the gimmickry. Which, of course, is the real point behind most outrageously priced restaurant offerings: Think the headline-grabbing $1,000 “Golden Opulence Sundae” offered by New York’s Serendipity 3. If anything, restaurants offer such items for the buzz they generate: Keller’s restaurant team anticipates selling only six FleurBugers a year. What’s the inspiration behind it? It turns out that the Alsace-born Keller is one burger-loving Frenchman. He’s opened a mini-chain of Burger Bar restaurants – in Vegas, San Francisco and St. Louis. Plus, he’s written a “Burger Bar” cookbook. He also offered a similarly expensive burger at a previous restaurant in Vegas. What’s the competition? Believe it or not, there are plenty of burgers out there with three-digit price tags. Most notably, New York’s Wall Street Burger Shoppe has its $175 “Richard Nouveau Burger,” which is also topped with foie gras and black truffles. On a more “budget-minded” note, Daniel Boulud offers the $32 “Original db Burger,” filled with braised short ribs, at his db Bistro Moderne in New York. But it turns out that Hurbert Keller, may not be able to claim the “world’s most expensive” title for his FleurBurger. The Carl’s Jr. chain has that honor – or at least it did back in 2006, when it introduced its $6,000 “combo meal” burgers, offered on the room-service menu at Vegas’ Palms Casino (the offer is currently not available). The “combo” part? You guessed it: a bottle of Petrus. This entry was posted in Food, Home. Bookmark the permalink.